You know, this idea has not escaped our thoughts! Jacob and I have often talked about the strategic location and the timing of our move to northwestern Uganda. 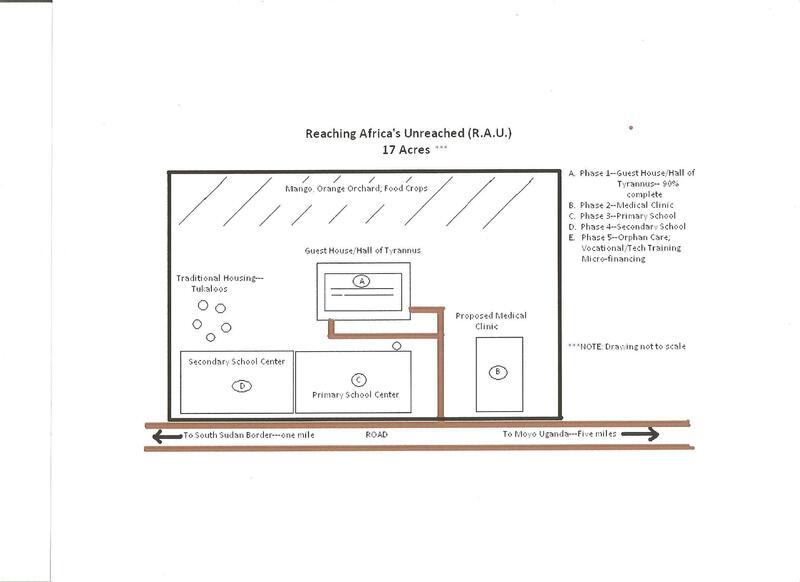 The 17 acres which Reaching Africa’s Unreached (R.A.U.) was able, by God’s grace, to buy is situated near Moyo, Uganda. This land is only a mile or two from the South Sudan border; R.A.U. land is about 6 hours (in good weather) by Land Cruiser from the Northeastern Democratic Republic of Congo. It is exciting to think we will be able to minister to the physical and spiritual needs of people in three different countries from this one location. So when it says, “For such a time as this“, we believe it! It has not been long since Joseph Kony and the LRA were terrorizing the northern part of Uganda. They have been forced out and northern Uganda is experiencing more peaceful times, but struggling with the aftermath of the violence, displacement of its people, and with a slow-moving economy and scarce access to medical care and education. So…“For such a time as this”? We are eager and ready! Perhaps you are more aware of the recent struggles being experienced by the citizens of the world’s newest country, South Sudan. It is also struggling to overcome the oppression and violence of its neighbor, North Sudan. Again, the aftermath of war has meant the cost and struggle of rebuilding, immense physical and emotional suffering and economic hardships. Again… “For such a time as this”? We don’t want to delay and squander the opportunity! It is a privilege for us to come alongside the people of this area—to bring resources—to take part in the healing process of people who have suffered unimaginably over decades. We want to see the healing of their souls—to see them reconciled to God through Jesus’ sacrificial love for them; to see the healing of their bodies through medical care and prayer; to see the healing of mind and heart through education and training. R.A.U has a vision and plans for all of these to take place on the land that has been purchased. And we really do believe that God has prepared us for such a time as this! The first phase of the plans is mostly complete (the Guesthouse/Hall of Tyrannus, where pastors and church leaders can be trained and ministry teams housed). We want to press on to begin the second phase, which is the Medical Clinic. We are grateful for the partnership we have with Nurse Sam, who is one of the R.A.U. Leadership team members. He exemplifies what can happen when vision, love and resources are made available to people who might not otherwise have a chance to improve their lives. Nurse Sam was a “street kid” in Kampala, who, by God’s grace, through the love and vision of a pastor, was rescued from a dead-end, dangerous street life. He was educated, mentored and brought to Christ. With the help of strategic givers, he is now a registered nurse, and has relocated to the Moyo area for the purpose of using his healing skills through R.A.U. in Jesus’ Name ! I really look forward to working alongside him. Our opportunities will be endless! *For every 100,000 live births, 440 mothers will die. Most of the deaths are directly related to pregnancy and childbirth complications; other causes are disease related. *In Uganda, for infants and children under age five, in 2008, 135 out of every 1000 (or13.5%) died–and this was an improvement from previous years. *About 1/4 of these deaths were neonatal or within 1 month of birth, and about 3/4 of them were postnatal, or between one month to five years of age. · Providing medical care through the clinic, making it more accessible and affordable. · Taking medical care to more remote areas as well. We are eager to get a medical clinic going! We have the land and we have the plans drawn up! All we lack are the funds to make it a reality! Just recently, we began a partnership with Mission World, who is committed to seeing the funds raised. It will take approximately $85,000 to get the clinic built. We are asking you to partner with us, to share the burden—to be a part of Reaching Africa’s Unreached! On a smaller scale, and for a more immediate need, I would like to put together two medical backpacks, or order them already equipped with stethoscopes, blood pressure cuffs, pulse oximeters and other assessment tools and basic first aid supplies to take with us when we travel to Uganda in June. Donations for these items would be greatly appreciated! Thanks for, not only being a hearer, but a doer of the Word!